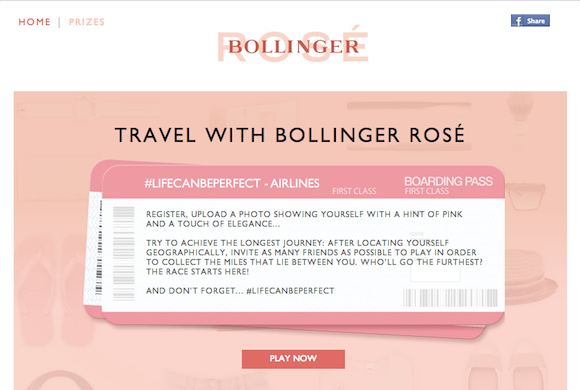 I was sent one to help promote a Facebook competition called “Travel with Bollinger Rosé”. The prize sounds great – a private visit for two at Bollinger, two nights at the five-star Château Les Crayères at Reims, and a gourmet dinner at the two-Michelin-star Le Parc restaurant (which is in the hotel). The nine runners-up prizes are pretty cool too. Jeroboams, Magnums, six-bottle packs, gift vouchers to spend at Vicomte A.
Bollinger get lots of new likes on their FB page, and social media goodness (presumably). You may win an amazing prize – or at least some bottles of pink Bolly (a full-bodied, fruit-forward style of Champagne). The contest closes on 31st August, and you have to be 18 or over to play.